For the American football official, see Shawn Smith (American football). Shawn Smith (October 28, 1965 – April 3, 2019)  was an American singer, songwriter and musician who was a member of several Seattle alternative and indie rock bands, such as Brad, Satchel, Pigeonhed and The Twilight Singers, as well as a solo artist. 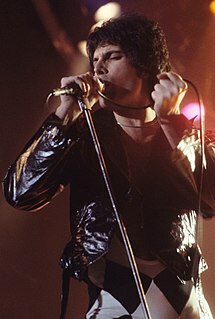 Freddie Mercury was a British singer-songwriter, record producer and lead vocalist of the rock band Queen. He was known for his flamboyant stage persona and four-octave vocal range. Kiss is an American rock band formed in New York City in January 1973 by Paul Stanley, Gene Simmons, Peter Criss, and Ace Frehley. Well known for its members' face paint and stage outfits, the group rose to prominence in the mid-to-late 1970s with their elaborate live performances, which featured fire breathing, blood-spitting, smoking guitars, shooting rockets, levitating drum kits, and pyrotechnics. The band has gone through several lineup changes, with Stanley and Simmons the only remaining original members. The original and best-known lineup consisted of Stanley, Simmons, Frehley, and Criss. Brad would go on to release five studio albums during their career (Shame, Interiors, Welcome to Discovery Park, Best Friends?, and United We Stand) and Satchel would issue three studio albums (EDC, The Family, and Heartache and Honey), while both bands would share credit for a compilation (Brad vs. Satchel). Lo Fidelity Allstars are an English electronic music group who have recorded since the late 1990s. 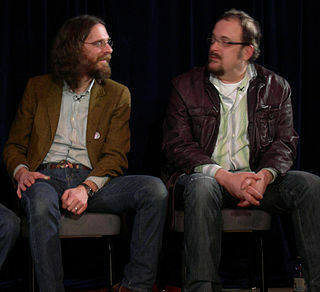 In 2005, Smith unveiled a musical project called "The Diamond Hand" involving many musicians. He also has worked with Thaddeus Turner (formerly of Maktub and many other projects including Brad) under the name Forever Breakers. Maktub is a Seattle, Washington-based music group formed in the late 1990s that combines elements of hip-hop, rhythm and blues, soul, and funk, with a sprinkling of jazz and rock. "Shake It (Like You Just Made Bail)", a song that remained unreleased until Shawn Smith made it available in digital format in 2007, was featured in the background of the cocaine scene of the "Proshai, Livushka" episode of The Sopranos (third season, 2001). "Leaving California" and "Wrapped in My Memory" from Smith's solo album Shield of Thorns were both featured prominently on the "Long Term Parking" episode of The Sopranos (fifth season, 2004). Yet another Shawn Smith related song has been featured on the show: Pigeonhed's "Battle Flag" appeared on the "46 Long" episode (first season, 1999) and was later included on "The Sopranos: Peppers & Eggs: Music from the HBO Original Series". "Battle Flag" has also been featured in a season six episode of NBC's prime-time medical drama ER, season three episode eleven of Showtime's drama Queer as Folk (US), as well as a season one episode of The WB's Smallville. It has also been featured in the film Coyote Ugly and the trailer for Charlie's Angels . How to Operate with a Blown Mind is the debut studio album by Lo Fidelity Allstars, originally released on Skint Records in 1998. Greg Dulli is an American musician. He has been a member of The Afghan Whigs and The Twilight Singers. ↑ "Soulful Seattle singer Shawn Smith dead at 53". Seattle Times. ↑ Prato, Greg. "Grunge Is Dead: The Oral History of Seattle Rock Music'". Toronto: ECW Press. Retrieved April 8, 2019. ↑ "Songwriter Interviews: Shawn Smith of Brad". Songfacts.com. Retrieved 8 April 2019. ↑ "Lo Fidelity Allstars Chart History". Billboard. Retrieved 7 April 2019. ↑ "Shawn Smith | Biography & History". AllMusic . Retrieved 7 April 2019. ↑ "Seattlest Interview: Kevin Wood of Malfunkshun, From the North: Seattlest". 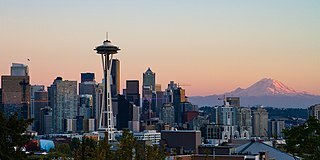 Seattlest.com. Retrieved April 8, 2019.